Is the "360 day Prophetic Calendar" interpretation missing a better literal rendering of what Revelation says? For a newer expanded treatment of this topic, see The Coming 360 Day Year Predicted in Revelation (1260 Days / 42 months). One thing that has puzzled many over the centuries is Revelation's clear indication that the last 3½ years (Dan 7:25; Rev 12:14) of Great Tribulation (Dan 12:1; Mt 24:21) will last exactly 42 months (Rev 11:2;13:5) or 1260 days (Rev 11:3) which obviously requires a 360 day year and 30 day month to work. But nobody takes this literally since everyone knows the year is 365¼ days and the month 29½ days on average and cannot conceive of that ever changing or if so, how. Yet, there is much historical evidence from ancient history that we were on a 360/30 calendar once before (from which we get our 360 degrees of a circle) until things changed in the 8th century BC (due to a close Mars passage according to Chuck Missler's 66/40 Bible series #BP047). my eBook Planet X In Bible Prophecy, I am still convinced that the literal global catastrophic events described in Revelation's 6th seal through 4th trumpet can only be explained by what the secular today call brown dwarf Planet X and Revelation calls star "Wormwood". By the way, I still hold to my understanding that the prophecies are true and require that certain things happen in Jerusalem before Planet X can come on some future day of Pentecost in late Spring. Therefore, not only can Planet X not come in 2003, but it cannot come in 2004 either, since these other events still have not happened and may be coming in 2004 themselves. 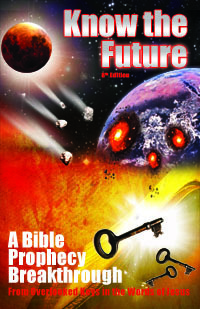 The earliest Planet X can come is late Spring, 2005 according to the prophecies. See also: 14000 Day Generation and Rapture on Rosh HaShana 2005? 1. Well, the simple answer is over a dozen other ancient calendars agree with Genesis' 360/30 calendar that you and many others notice does not match today's 365¼/29½ calendar.